These easy to use search operators can help you in finding precise information in less time and efforts. Use these techniques to become a power user of Google search engine. Well, the answer is yes! If you think you know Google Search well, think again! Google search has become almost inseparable part of our lives. For every sort of information we look up Google’s massive database which contains index of almost all the webpages on Internet. Google search engine also has been delivering on the promise it makes. No doubt, through Google the world of information (or information of the world) stays on our fingertips. Google provides all kinds of operators and some interesting facilities (like countdown clock) to make search easy and fun. Although, Google wants you to spend less time on their website, but still how much time do you spend on searching information through Google? I guess, it is safe to assume that a significant amount of time goes into looking for the information you need. For most people Google is all about asking questions. Most people type full questions in Google search; e.g. Those who understand the working of Google better –they type only keywords –saving time and effort of typing full questions; e.g. This is good. However, Google search is not entirely based on keywords. Google empowers its users with a lot of options which you can use to reach the desired information in lesser time. Lets have a look at some of these options. I have selected only those which could be useful for a common user. 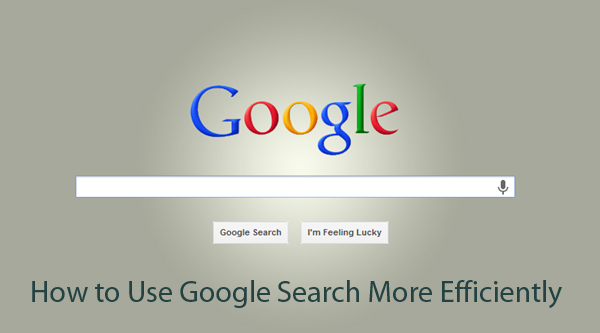 Google search engine can be used with higher efficiency. This operator forces search engine to definitely consider the keyword. Here Google will be forced to show you only those webpages that contain “discount” keyword. If you would not use + operator then Google will also show the results which will be relevant only with “pizza” and “saket” but will have no “discount” in it. Another use of + operator is to force inclusion of words like “where”, “how”, “I”, “my”, “of” etc. in search results. Normally Google does not consider these words even if your type them in search. To force a keyword’s exclusion from search results. This example will force Google to show results where “pizza” is there; and/or “saket” is there BUT “hut” will definitely not be there. Google will return results for: “inexpensive gloves”, “cheap gloves”, “affordable gloves”, “low cost gloves”. Therefore, you are actually doing several relevant search in one go! Two dots (..) are used to denote a number range. There should not be any space in between or on either side of these two dots. This search will return results relevant with European history but will also make sure that the webpages have numbers between 1400 to 1450 in them. Asterisk (aka star) sign is used for matching any one or more words. E.g. This search will bring you results related with all the genre because * can be replaced by anything. For instance this search can match with “movies of drama genre”, “movies of comedy genre”, “movies of horror genre” etc. In Google quotes are used to look for a phrase. This search will bring you only those pages where complete and exact phrase “Roshan likes sunshine” will be found. If you will not use quotes around phrase –the search results will also include pages where words “Roshan” and/or “sunshine” will appear. The use of these operators is self-explanatory. "lawn tennis" AND "table tennis"
"Cricket stars" NOT "match fixing"
Will return webpages related with cricket players but will exclude pages having reference to “match fixing”. This operator works exactly like minus operator discussed in previous part. This search will return all the pages from TechWelkin where the keyword “software” will be found. If you want to find definition of something –this operator will give you the answer right away. This search will bring you the ever illusive definition of love! If you want to know which sites link to a particular website –use this operator. This search will show webpages where there is a link to wikipedia.org. Google, however, does not show all the backlinks. The search will contain only a random set of results found. It return information about movie shows. This search will ask you to enter a city name. When you will enter location, “Delhi” for example, the list of all the theaters showing Ra.One movie will appear. This was about using operators to get to the desired information quickly. But Google has more facilities in store! If you type a mathematical calculation in search –Google will return the result. Sometimes it is a quicker way to get answer than running your desktop calculator. If you cant remember these operators –I would suggest you use advanced search option of Google –where all these operators could be easily selected. I hope it was useful. Please feel free to ask me if you have any questions on the topic of better and efficient Google search. I will be happy to try and help you. Thank you for using TechWelkin. Great info – do you have examples or hints specific to genealogy searches?